KNOXVILLE, Tenn. — A police department in Tennessee has decided to relocate a Scripture plaque that has long been displayed on its walls following receipt of a complaint from a prominent atheist activist organization. 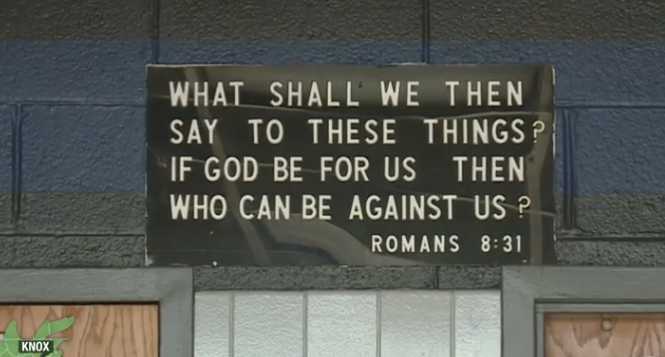 Knoxville Police Chief David Rausch explained during a news conference on Wednesday that the plaque, which quotes from Romans 8:31, will be moved from near the employee deli to a soon-coming Hall of Inspiration inside the the Safety Building. “What shall we then say to these things? If God be for us, then who can be against us?” it reads. Rausch had received an email from the Wisconsin-based Freedom From Religion Foundation (FFRF), which asserted that the plaque was in violation of the U.S. Constitution. The group threatened a lawsuit if the display was not removed. Mayor Madeline Rogero, who identifies as a Christian, advised during Wednesday’s press conference that officials did indeed consult with Knoxville law director Charles Swanson and concluded that it was in the best interest of the city not to spend taxpayer money defending the plaque. However, former investigator, Don Wiser, told reporters that when a nation turns away from Jesus, wickedness abounds. Rausch said he will be praying for FFRF. “I pray that their souls will be softened by the love of God, and they understand that they can have us remove words but they cannot remove our faith and what is in our hearts,” he wrote in an email obtained by the Knoxville News Sentinel. An online petition has already been circulated in an effort to keep the plaque.